Hakusan, Japan, November 22, 2012 – Eizo Nanao Corporation (TSE: 6737) today released ColorNavigator Elements, a free software application that presents entry-level users with an easy-to-use solution for matching the color of EIZO ColorEdge CX and CS monitors to photo prints. ColorNavigator Elements simplifies color matching by allowing the user to adjust the screen to match prints through visual perception. The software creates a profile and then the built-in correction sensor of ColorEdge CX and CS monitors records the user’s adjustments. To maintain the display settings, the built-in correction sensor automatically readjusts the monitor at user-specified intervals. Right out of the box, ColorEdge CX and CS monitors’ default support for ColorNavigator Elements delivers the industry’s only color matching solution without the need for an external calibration sensor. 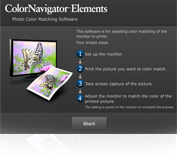 ColorNavigator Elements offers not only easy monitor color adjustment to photo prints, but also a fully automated way to maintain a monitor’s color settings. The first models supported by ColorNavigator Elements are the ColorEdge CX270 (27"), ColorEdge CX240 (24.1"), and ColorEdge CS230 (23"). ColorNavigator Elements is now available from eizo.com at the following URLs and will be bundled with ColorEdge CX and CS monitors from the beginning of 2013. Founded in 1968, Eizo Nanao Corporation is a leading global manufacturer of high-end visual display products. The image quality, long-term reliability, and innovative features of EIZO monitors make them the products of choice in many financial trading rooms, back offices, hospitals, air traffic control centers, and design studios throughout the world. EIZO is based in Japan and listed on the first section of the Tokyo Stock Exchange. It is represented in over sixty countries by a network of group companies and exclusive distributors.